Few trails or areas are perfect, free from all problems. When humans use trails or wilderness areas they damage it, it is impossible not too. The trick is to manage the impact. We can (1) minimize the disturbance, (2) make a heavily used area attractive through design (and even more disturbance) to allow heavy use in that area (eliminating impact to other areas), or (3) strike a compromise between the two. An old joke goes something like ... I went to the doctor and told her my leg hurts when I run and then asked, what should I do? The Doctor looks at your leg and she simply says, stop running. To re-tell the joke to show a land managers response instead of a doctor ... The hiker goes to the land manager and says, the camping area is really impacted, what should we do? The land manager answers, close the access to the area! Sometimes absolute answers are the only solutions, but most often a compromise is needed. To solve or ease problems associated with our use of the outdoors we must first we aware that a problem exists. The above lead picture shows a slippery slope where the trail crossed a paved road. The runoff from the slope above the road and the road itself drained down the path. 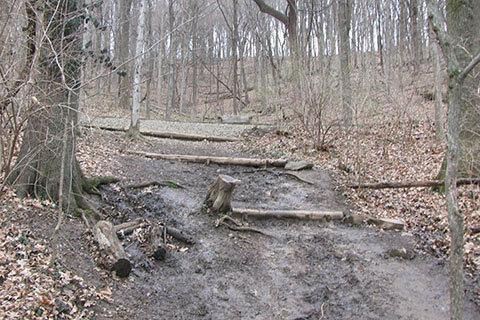 Many hikers who used the path saw the muddy trail and created avoidance paths to keep their feet from getting soiled. Logs were positioned across the trail to channel the water away from the path, but the trail followed the line of least resistance and needed more than a few bars to divert the flow. The trail was still muddy. Finally, gravel was placed to harden the surface (not seen in the photo.) Its odd, that many users did not seem to like the gravel either and continued to make avoidance paths, but instead of avoiding mud they were avoiding the gravel! The users were unaware that they were contributing to the problem by not walking on the gravel. Once you are aware of the problem, you can then take steps to avoid contributing to it. Simple solutions might be to stay on the trail and just get your feet muddy or to not hike the trail when it is muddy. For example, in one of our local parks, we know which trails (or sections) are muddy and when they are at their worse. We use the maps and our knowledge of the area to find ways to avoid the sections of trail when they are truly muddy. We are able to prevent adding to the problem by our commitment to minimum impact usage. Commit to minimum impact usage. Think of solutions and actions that you might be able to use on the trail before you start the hike (run, walk, ride, visit, etc). What actions can you take that will lessen your impact? With each step along the trail, access the trail and the impact of hiker's use. It's not as hard as it seems! It's just takes being aware. Stay on the trail or hardened area. If you don't like the condition of the trail, don't blaze an avoidance path. Mud really does wash off. Another option is to skip the section. Know all the trails in the area and avoid the muddy ones, if you find it impossible to walk in the mud. Lastly, just turn around and find another trail to hike. Poorly designed trails (or trails that were made from use not design) become problem trails. Encourage the development of sustainable trails. My wife (my number one hiking companion) and I discuss the trail as we hike. The conversation helps us commit to such things as walking in the mud (which I must admit does not seem natural) or picking up trash along the trail. With groups - minimize the numbers in the group, make sure everyone in the group commits to minimum impact usage, the leader should point out problem areas on the trail and show procedures to use to prevent further impact. Give a donation of time or money to park to fund a permanent solution to the problem. The land in our parks has been set aside for us to use. The land means many things to many people. Whatever your use, be aware of your impact and take the necessary steps to use the land wisely, preventing damage.